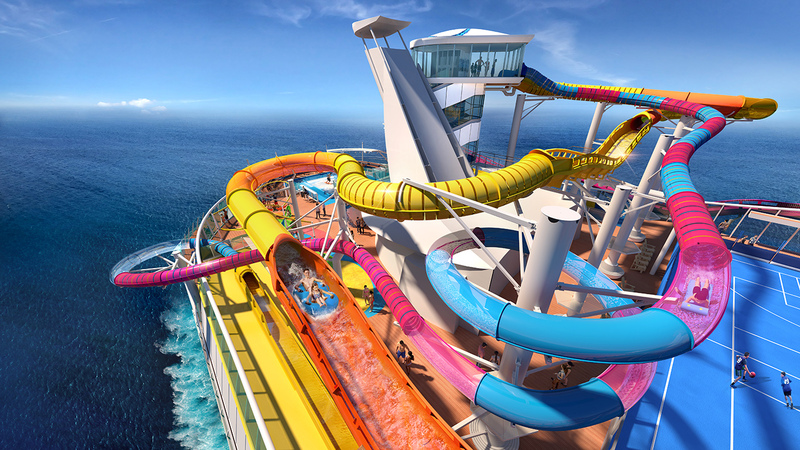 Royal Caribbean has revealed plans to install the world’s longest waterslide at sea on its ship Navigator of the Seas. The Blaster will propel a two-person raft through more than 800 feet of hills, drops and straightaways including a section that extends over the side of the ship for a unique thrill ride. The Blaster is just one of many new additions guests can expect from Navigator of the Seas’ $115 million makeover when she re-launches on 24 February 2019. Also featuring is Riptide, which will plunge riders headfirst down the cruise industry’s very first mat racer, finishing with an exhilarating home stretch through a translucent tube offering breath taking ocean views. “Each Royal Caribbean ship brings a new adventure uniquely designed to deliver on our guests’ preferences from A to Z,” said Michael Bayley, president and CEO, Royal Caribbean. Additional features of Navigator of the Seas’ multi-million-dollar makeover includes To Dry For, the first standalone blow dry bar at sea, laser tag, an escape room, Mexican restaurant El Loco Fresh and The Lime and Coconut, a two-level signature cocktail bar. Navigator of the Seas will be the first in the Royal Caribbean fleet to visit Perfect Day at CocoCay, the debut destination in the cruise line’s recently announced private island collection, opening in May 2019.